I visited this site twice during my visit, once in the morning and again that evening. Although the the light was good on both occasions, it was still at the wrong angle to bring out the designs inscribed on this beautiful schist slab. I think the best time to visit would be around mid-day. The 1.6 metre tall slab stands in a circular enclosure almost 4 metres in diameter. The patterns imitate the designs on metalwork from the 8th or 9th century. The east face has three square panels, similar to those on station two. The west face has to parallel bands running up the centre of the stone and ending in four square panels at the top. Half way up the slab there is a boss or circle with loops on either side. This is also similar to the designs on station 2. The turas station sign had at sometime fallen over and sadly, with complete disrespect for this beautiful pillar, it was tied to the slab with a piece of rope. Hopefully someone will see sense and erect the sign in a more appropriate way. Hopefully I will get back this year and get some quality images of the decoration on this beautiful Early Christian slab. Legend has it that St. Patrick tried to enter the Glencolumbkille valley but could not fight past the demons in the mist. The legend continues that Columcille confronted the demons here and drove them into the sea. Situated: Quite easy to find. 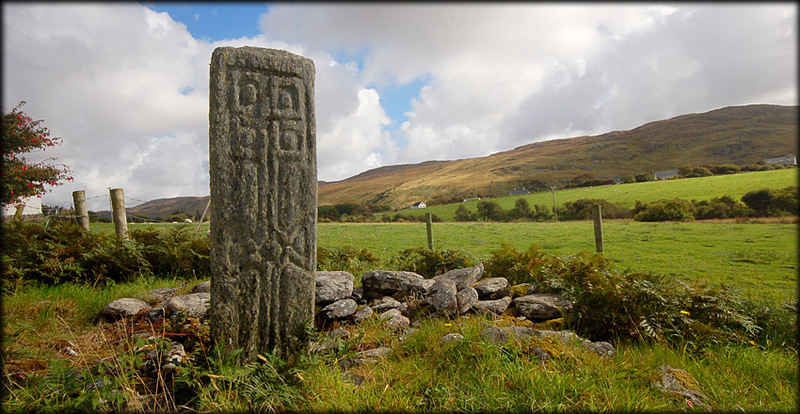 It is located in Drumroe, between station 10 and 11 on the opposite side of the road. Just look for the small gateway pictured right. Discovery Map 10. G 5414 8502. Last visit Sept 2010.